I always get it in the neck when I use the words 'lifestyle choice'. "Why would anyone choose to be on a benefit?" DPB defenders remonstrate. Well research from Geoff Dench, a fellow of The Young Foundation, has confirmed that many single mothers are making a lifestyle choice and favouring benefits over fathers. One in four mothers is now a single parent, having made a 'lifestyle choice' to rely on benefits rather than a partner, a report revealed yesterday. In NZ at last census 28 percent of parents with dependent children were single. Around three quarters rely on welfare. More than half of mothers with children under 13 have never married or lived with a boyfriend and find it 'rewarding' to stay at home supported by state handouts, it said. So how does NZ compare? ...The report said there is growing evidence that 'lone motherhood is less a result of relationship breakdown, more a lifestyle choice'. ...The findings run counter to the claim, regularly made by pressure groups for single parents, that women most often become lone mothers because of divorce or separation. ...The analysis was based on findings from British Social Attitudes, the annual Government-backed survey of opinions and lifestyles that has been run every year since the early 1980s. It shows that in the 1980s it was true that a typical single mother had broken up with a partner after years of marriage or cohabitation. In 1986 only 15 per cent of single mothers of children under 13 said they had never married or lived with a partner. But by 2006, 57 per cent of single mothers had never lived as part of a couple. ...At the same time, more than three million men are classed as 'economically inactive', and live on sickness benefits, state handouts or in the black economy. Good for the Anglicans. At last a religious organisation prepared to break with the usual advocacy stance of the Social Service and Catholic councils. In Australia the Brotherhood of St Lawrence are backing the government plans to extend income management beyond Aboriginal communities. Income management means a beneficiary receives their income part cash/ part credit, which can only be used for specified purposes. There is less potential for cash to be misused or stolen and greater potential for children to get fed and clothed. The Australian Council of Social Service has said the changes would make income support recipients' lives harder and less dignified, and Catholic Social Services Australia has said they are unjust and may undermine social inclusion. These groups have their counterparts in NZ. Invariably the Salvation Army, the NZ Council of Christian Social Services and National Council of Women oppose any suggestion of tightening welfare. But the Brotherhood of St Lawrence have taken a different tack, the common-sense approach. Generally I reject paternalism but if people can't manage their own lives, and as a result are damaging the lives and prospects of their children, then something has to give. If a dysfunctional beneficiary doesn't want their income managed there is a solution. Get a job. There are people whose comprehension of a given situation is exactly the reverse of mine. Here are two examples. "It is a sacrifice, really. I am perfectly capable of earning." A sacrifice? It's abuse. It's abuse of those who fund a welfare system which is sold as being there for people who genuinely cannot support themselves through work. It would seem to me that the Lindsay's of this world tend to want women to be trapped in unhappy and sometimes abusive marriages 'for the sake of the kids'. I find that unacceptable. People's family arrangements are no place for anyone to stick their nose in. Especially the 'collective' people as represented by the state. Oh no, I forgot. Feminists approve of that. They want their next door neighbour to fund them out of a bad relationship but otherwise, keep their nose out. Very convenient. Feminists are clamouring for the state to stick its nose into family affairs when it suits. Paid Parental Leave, subsidised childcare, marital property legislation, state-funded anti-violence campaigns, state-funded pro-breastfeeding campaigns, a female biased Family Court. The examples are many. They even have their own government department. So there are two examples of people who inhabit this Alice in Wonderland world we live in. Where up is down, and down is up. Statistics NZ has released projections that show Auckland's population will grow to 38 percent of the country's total by 2031. Two thirds of the growth will come from natural increase - births minus deaths. The population of Auckland has been growing faster than the national average for some time. The natural growth that has already occurred is reflected in numbers on the DPB. Between 1999 and 2009 the national DPB total dropped 1 percent. But in Auckland the number rose by 16 percent to 37,376. Additionally the numbers that are aged 18 and 19 grew by 38 percent. Auckland certainly is breeding and brewing plenty of social problems for itself. The forum on Auckland social policy should have this issue as its number one priority. 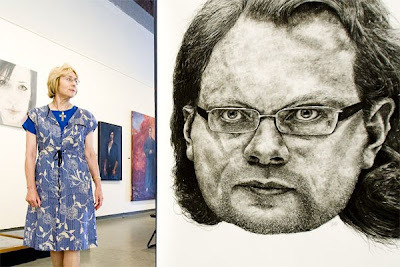 The National Portrait Competition is gaining unusual publicity this year due to the exhibition of a large sketch of Clayton Weatherston. I was disappointed not to be part of the exhibition this year. It's the first time I have missed out. Strangely with what I thought was probably my best entry since it began. So it is always interesting to see what does get selected. I left my entry very late and then quickly painted this of a friend. I hadn't developed a background or honed in the features and clothing because I sometimes get criticised for tending towards too much realism and time prevented it. The colours are also stronger and more various than I would normally use. Now I may rework it and show it in my April exhibition. But I can hear my friend when she sees the front page of the DomPost this morning at teabreak. "Eh? They turned me down and took him?? Faaa....."
I think the Weatherston portrait is very good. Sometimes I think over-size faces are a bit gimmicky but there is no question over whether or not it should have been exhibited. What must it be like living in the States right now? Putting aside the financial hardship many are enduring (that is not to minimise it in any way) I might rather enjoy the growing level of political cynicism. Most Americans think Washington is screwed and most think neither the Democrats nor Republicans have answers worth voting for. I wish a few more New Zealanders would wake up to the problem of the big government parties on both sides of the political spectrum. After he signed a law last week authorizing the U.S. Treasury to borrow an additional $1.9 trillion, President Barack Obama delivered a characteristically sanctimonious speech. It was about his deep commitment to frugality. To put Obama’s Olympian hypocrisy in perspective, one need only examine the federal budget tables posted on the White House website by Obama’s own Office of Management and Budget. ...Fatherlessness is a major contributor to increasing rates of juvenile violence,” says Bob McCoskrie, National Director of Family First NZ. The feminist blog, The Hand Mirror, has interpreted this as an attack on solo mums. NZ is particularly prone to letting the left rule the roost on this sort of stuff. Middle (apolitical) NZ has let feminists shut down the debate on the whether family structure matters by being bullied into accepting that solo mums are victims. Feminists, who know how powerful a weapon guilt is, wield it unhesitatingly and very effectively. Mothers, particularly sole mums, are sacrosanct. Perhaps it is time to start recognising that it is children who are victims. If children's need were elevated above those of their mothers, because their needs are often conflicting, perhaps some progress could be made. Though frustratingly little is known about whanau ora it is safe to say that it is about Maori solutions for Maori problems. Doing things the Maori way. To explore the possible role of cultural identity in mediating associations between ethnicity and childhood maltreatment, the group of Māori respondents was subdivided into those of sole Māori identity and Māori/other identity. The data were then re-analysed to examine the premise underlying current theories in New Zealand that claim that strength of Māori cultural identity mitigates the risk of young Māori people being exposed to child maltreatment. Following adjustment for socio-economic and family functioning factors, this re-analysis revealed a complex set of relationships between cultural identity and risks of childhood maltreatment. In terms of childhood sexual abuse, those of sole Māori identity had the lowest adjusted rate of exposure. Although these differences failed to reach statistical significance, the findings provide some support for the view that being of sole Māori identity may be a protective factor that reduces risks of exposure to childhood sexual abuse. However, quite the opposite pattern was observed for exposure to childhood physical abuse and exposure to inter-parental violence, with those of sole Māori identity being at greater risks of these outcomes. The results suggest that sole Māori identity may be a risk factor for exposure to physical child abuse and inter-parental violence. The findings are in general agreement with research by Kukutai (2003), who suggested that the degree to which an individual identifies with Māori cultural identity may be associated with increased risks of social and economic disadvantage. These findings, however, are not consistent with the assumptions underpinning influential theories, social policies and a number of intervention guidelines (Department of Social Welfare 1988, Ministry of Social Development 2002, Balzer et al. 1997, Stanley and Thompson 1999, Kiro 2000, Stanley 2000, Kruger et al. 2004), which claim that strengthening Māori identity and links with traditional Māori cultural practices will lead to reduced rates of child abuse among Māori. To the contrary, while the findings of this study suggest that this approach may lead to reduced risks of childhood sexual abuse, it may also be associated with increased risks of childhood physical abuse and exposure to inter-parental violence. These findings do pose a challenge to current policies aimed at reducing the over-representation of Māori children in rates of child maltreatment, which emphasise “identity interventions” that are not evidence-based and are largely ideologically driven. Even though such policies are no doubt well intentioned and observe statutory requirements unique to the New Zealand context, following the view expounded by UNICEF (2003, 2007), they must be exposed to ongoing critical scrutiny and empirical evaluation.